You can’t trust yourself when you drink. Put the keys away and plan a sober ride home. Always remember to Ride Sober or Get Pulled Over. AS YOU ENJOY ONE LAST SUMMER RIDE, DON'T LET IT BE YOUR FINAL RIDE EVER. The long, warm days of summer are nearly over, and riding season is winding down. Marked by the Labor Day weekend, the end of summer is your last chance for pool parties, backyard barbecues and family picnics. It's also the last call for long, summer rides—just you and your bike, soaking up the sunshine and feeling the wind rush by. As you hit the road this Labor Day (and every day), remember to practice safe riding habits. The most important safety habit is to ride sober. Drinking alcohol drastically impairs your ability to operate a motorcycle (or any vehicle). Riding while drunk is not only illegal, it puts yourself and everyone else on the road at risk of serious injury or death. Any time you plan to drink alcohol, don't even think about riding your motorcycle. Remember: Ride Sober or Get Pulled Over. Alcohol consumption impairs your thinking, reasoning and muscle coordination—all vital abilities to operating a motorcycle safely. At a .08 Blood Alcohol Concentration (BAC), your crash risk increases exponentially. Because of this risk, it's illegal in all 50 states, the District of Columbia and Puerto Rico to drive with a BAC of .08 or higher. But even a small amount of alcohol can affect driving ability. 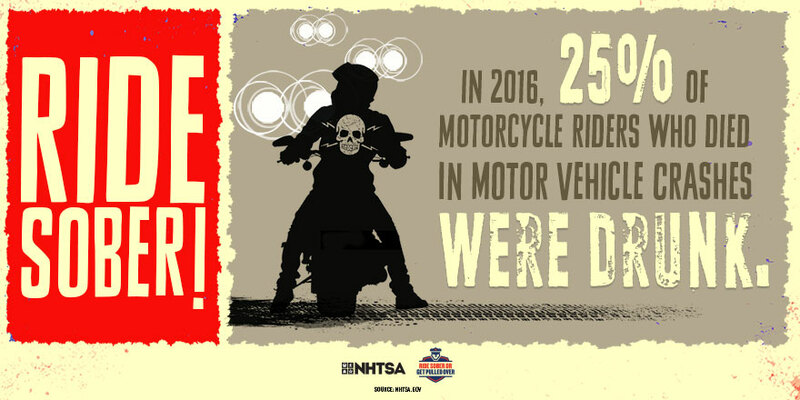 In 2016, 38% of drunk-riding motorcycle fatal crashes were caused by drivers between the ages of 34 and 39. If you've had too much to drink, leave the bike and call a friend to get home safely. Being responsible is easy—if you are drinking, do not ride your motorcycle. Your life, and the lives of others are at risk if you do not have a responsible plan to get home safely from your Labor Day party. Here are a few tips to help you have a safe and fun night of celebration. Before drinking, plan a sober ride home. Use NHTSA's SaferRide app to call a taxi or a friend. The app is available on Google Play for Android devices and Apple devices on the iTunes store. If you are hosting the party, make sure all guests leave with a sober driver. If you see a drunk rider on the road, call law enforcement immediately. Always wear a DOT-compliant helmet and protective clothing; they're you best defense against drunk drivers. NHTSA offers materials for numerous traffic safety campaigns, including drunk riding. These marketing tools provide easy ways to get involved with campaigns.